Textkernel has expanded its ‘Apply with’ widget with the options to apply with a Monster profile and apply with a CV stored in Microsoft OneDrive. The ‘Apply with’ widget is a tool provided by Textkernel that enables companies to offer their applicants a candidate-friendly one-click application process, which is also optimised for mobile. With the widget, applicants can choose to apply using their CV, either via upload or via a third-party such as Google Drive, Dropbox and now also Microsoft OneDrive. In addition, they can choose to use one of their online profiles, such as their LinkedIn or XING profile and from now on, also their Monster profile. Monster is one of the top job boards in the market and many job seekers own a Monster account. 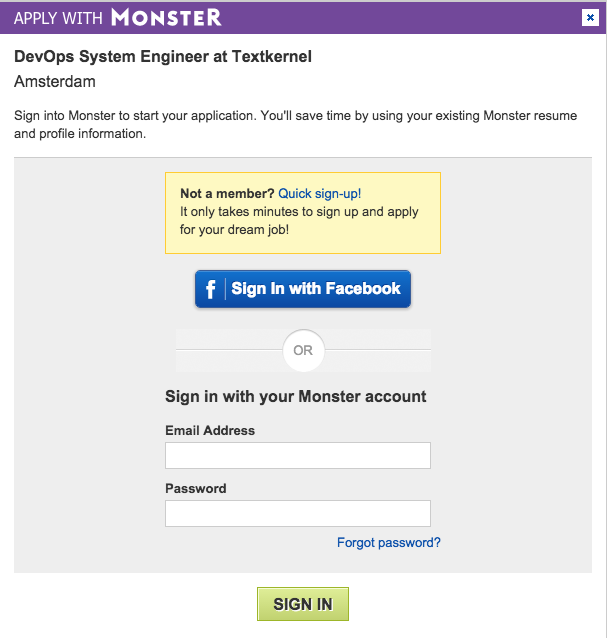 In order to provide job seekers with the opportunity to apply with their Monster resume, Textkernel has added the Apply with Monster option to its widget. When a candidate applies for a job with his or her Monster profile, Textkernel’s CV parsing software extracts, structures and normalises all information from the profile and stores this in the structure of the company’s database. OneDrive is Microsoft’s service for hosting files in the cloud. Everyone with a Microsoft account can get free access to store, sync and share their files with other people and devices on the web. Long forms or the inability to add a CV / resume (which is not always stored on the computer or mobile the applicant is using) trigger high drop-off rates. By offering job seekers the ability to apply with their CV / resume stored in the cloud, you can enable mobile apply and increase the conversion rate. Textkernel’s ‘Apply with’ widget now incorporates Microsoft OneDrive in addition to GoogleDrive and Dropbox. Textkernel’s Apply with widget enables a fast and easy (mobile) application process that increases the completion rate and improves the candidate experience. Would you like to make your application process mobile and more candidate-friendly? Contact Textkernel for more information or a demo.